This entry was posted on May 12, 2015 by Posturite. Sudden cardiac arrest is the UK's biggest killer. Some 100,000 people die every year – more than breast cancer, lung cancer and AIDS combined. Anyone, anywhere, at any time could suffer cardiac arrest, regardless of age, fitness or any other factors. The person often has no symptoms and loses consciousness immediately. Every second is crucial in trying to save their life. 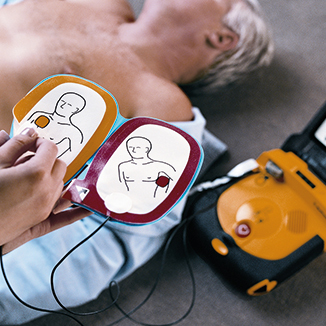 Early intervention with an automated external defibrillator, combined with CPR, can improve survival rates to as high as 74% if defibrillation is provided within three minutes of collapse. Yet amazingly, thousands of UK companies and public buildings still don’t have an AED on their premises. This is such an important subject that we have included, it as a cornerstone of our current nationwide programme of free seminars that next month reaches Newcastle. We’ll be at St James’s Park, home of Newcastle United, on Wednesday 3 June for a half-day event with the title “A Matter of Minutes” – often the difference between life and death for someone suffering a cardiac arrest. Paul Bean from Physio Control, manufacturers of the LifePak AED, will join us to show you how the products are used, enable you to learn key facts about cardiac arrest, and discover the training packages that are available to ensure that any AEDs you purchase are used correctly and effectively should the need arise. The event gets under way at 10.15 and will end with a lunch at 12 noon and a tour of St James’s Park for those who request it. Click here to reserve your place or to find out more information. We’ll also be taking our free AED seminar to Cambridge on 24 June, Warrington on 10 September and Birmingham on 15 October. Other important health and safety subjects are also covered in our free seminars programme including Empowering & Enabling Staff, Reasonable Adjustments, Sit-Stand Desking and Cost-Effective Ergonomics. You can find out all the dates and venues through to October by visiting our events page.